Rosa Parks is often remembered as one of the defining individuals of the Civil Rights Movement. On a cold December night and after a long day at work, Parks refused to give up her seat to a white man on a Montgomery City bus. Rosa Parks’ actions have long been characterized as a spontaneous, courageous act by an ordinary American tired of the false American labeling of freedom and equality. For the sixteenth annual Anita S. Goodstein Lecture in Women’s History, Jeanne Theoharis provided a compelling counterargument to the lasting memory of Rosa Parks. 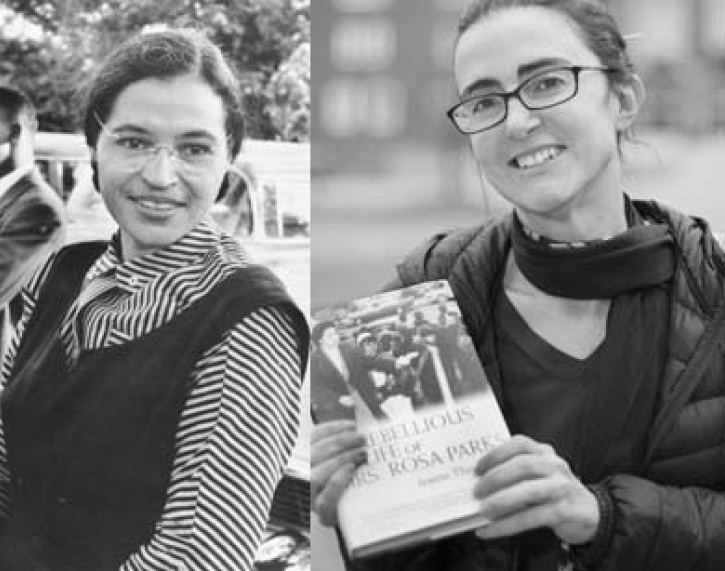 In the lecture lecture, appropriately titled The Rebllious Life of Mrs. Rosa Parks, Theoharis reminds us that Parks’ decision not to give up her seat on the bus was spontaneous and corageous, but those familiar with Rosa Parks would categorize her as anything other than ordinary. Rather than being a regular woman too tired to give up her seat, Parks was an activist spending many of her days fighting for the equality of herself and African Americans everywhere. At a young age, Parks was introduced to the teachings of Marcus Garvey and exposed to the horrifying effects of white violence on black Americans. In 1943, Parks began her activist career by joining the NAACP, being elected secretary of the Montgomery Branch at her first meeting. Parks began working to collect African American stories about violence against African Americans and helping Alabama blacks register to vote. Such tasks proved difficult for Parks African Americans were often too scared to speak against powerful white citizens and Parks herself was denied the right to vote twice before passing discriminatory literacy tests. Parks lost hope that change would come from her generation. After spending two weeks at the Highlander Folk School in Monteagle, Tennessee, Parks found that her blackness was not recognized by the white Americans there, an experience she never knew was possible. She left Highlander with a better hope for the future generation and came back to Montgomery equipped to participate in non violent resistance. Disheartened after learning about the acquittal of Emmet Till’s murderers, Rosa Parks famously refused to give up her seat on the bus four days later. Parks was subsequently arrested and although she did not speak out after her arrest, her actions motivated the black citizens of Montgomery to boycott the buses. The black community began carpooling and walking to work, with the loss of revenue forcing the bus company to face bankruptcy. Parks’ story often ends here, yet Parks continued her life in Detroit pursing social justice, continuing to fight for the civil rights of all Americans and actively speaking out against the Vietnam War. Jeanne Theoharis’ lecture reminds us that although American memory often pegs Rosa Parks as a tired old woman who refused to give up her seat on the bus, her life of activism stretches far before and far after that moment. Although Rosa Parks was anything but an ordinary American who refused to give up her seat, Theoharis makes clear that this does not have to be the case. Parks was not a robotic entity who made her decision and lived the rest of her life in peace. Rosa Parks was a woman with emotions and her own set of difficulties who remained committed to the rights of all Americans. Parks’ life of activism and commitment to social justice is one that is available to all Americans’ who pursue it.